Last spring, Carnival Cruise Line launched Carnival Horizon. 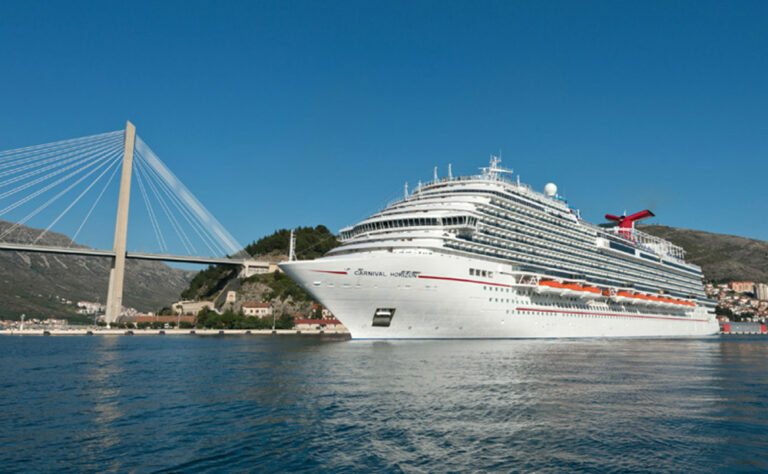 Boasting more innovative features, upscale stylings, better dining options and more amenities, the Carnival Horizon offers guests ample opportunities to “choose fun.” The ship features 1,980 guest staterooms and suites, including 25 accessible staterooms. Large groups will enjoy the Family Harbor staterooms, with access to the exclusive Family Harbor Lounge — complete with large-screen TVs, complimentary breakfast and a personal concierge. Enhanced onboard dining includes Guy’s Pig & Anchor Smokehouse|Brewhouse and Bonsai Teppanyaki — both a first for the Carnival fleet. Guy’s Pig & Anchor Smokehouse|Brewhouse serves up slow smoked beef and pork and hearty sides like beer-braised cowboy pinto beans and longhorn cheddar mac & cheese. Pair your barbecue-inspired dishes with a ParchedPig beer crafted onboard by the ship’s own brewmaster. Additional food and beverage upgrades include new menus for Fahrenheit 555 steakhouse, Cucina del Capitano, and The Carnival Deli. Other meal options include Reflections Restaurant and the Meridian Restaurant, popular BlueIguana Cantina burrito bar, Guy’s Burger Joint, a 24-hour pizzeria and others. Feast on silly Seuss-inspired breakfast items like Green Eggs and Ham during the Dr. Seuss character breakfast experience. Carnival Cruise Lines’s lure for families is partly thanks to their “fun for all” mantra that translates into high-quality children’s programs, varied onboard activities and all-inclusive entertainment options. From trivia games and competitions to high-caliber productions and engaging game shows, Carnival Horizon boasts a bevy of activities for families. The IMAX theater and Thrill Theater feature 3D visuals and motion effects. Guests also love SkyRide, a two-lane suspended course on the top deck. Carnival Horizon’s Dr. Seuss WaterWorks is another first for the Carnival fleet. The water park features two, four-story slides and a 150-gallon tipping water bucket. Is a Caribbean cruise vacation on your radar? With 6- and 8-day itineraries to western, southern and eastern Caribbean from now through 2020 — there’s one to fit your calendar. Member Savings: Up to $75 onboard spending credit (per stateroom), two-category upgrade and 50% reduced deposit on select Carnival sailings! Call 800-398-0379 today!